Three teenage friends in rural Texas are forced to commit a robbery for a local gangster. In rural Texas, teenagers Sue (Davis), her boyfriend BJ (Huffman) and her secret lover Bobby (White) head off to Corpus Christi for a final night of debauchery before Sue and Bobby leave for college in the fall. The night is a treat courtesy of BJ, who splashes large amounts of cash around throughout the evening. The next morning, BJ reveals to Bobby that he acquired the money by stealing it from Giff (Pelligrino), a local gangster whose employ the pair are in. When they find Giff torturing an elderly Mexican man who he believes is the culprit, Bobby claims responsibility in an attempt to save the wrongly accused man, who Giff shoots dead regardless. To make amends for the theft, Giff forces the two men, along with Sue, to steal money from another local mobster, Big Red (Devane). With their feature debut, the Hawkins brothers, along with the wonderfully named writer Dutch Southern, wear their influences on their characters' flannel sleeves. When we first meet Sue, she's attempting to get Bobby to read a novel by her favourite crime writer, Jim Thompson. 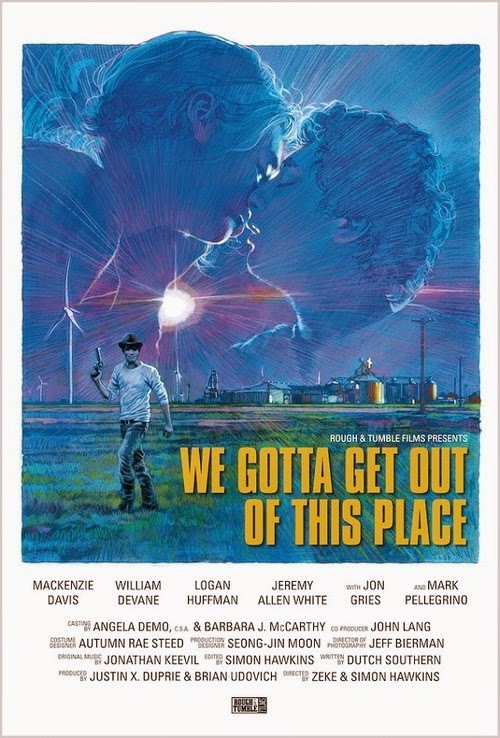 Like the novels of Thompson, We Gotta Get Out of This Place belongs to the sub-genre of SouthWestern noir, but the clumsiness of the script and direction creates an awkward dynamic that feels like The Hardy Boys meet Nancy Drew by way of Gregg Araki. It's impossible to invest yourself in this particular tale of dodgy deeds because the world created isn't the least bit realistic. You simply can't buy that two clean-cut kids like Bobby and BJ would be working for someone like Pellegrino's violent and cliched gangster Giff. We never learn in what capacity they're in his employ, but it's impossible to draw a connection between these two worlds. Similarly, it's too much of an ask that someone as seemingly sophisticated and worldly as Sue would waste her time with these little boys. The era this story takes place in is equally puzzling, as the soundtrack features a very contemporary brand of Alternative Country Rock, yet cellphones are conspicuous by their absence. There's a disturbing trend emerging in mainstream Hollywood of disposable non-white characters, and it seems to have trickled its way down to the indie scene. The Hawkins' movie begins with the cold-blooded murder of a Mexican, only for it then to ask us to invest our sympathies in its central trio of WASPish teens, but the film does little to elicit such loyalty and leaves a nasty taste in our mouths that lingers to the closing credits. The central acting trio have all done impressive work before, and Davis has been quietly edging her way towards stardom with a series of scene-stealing minor roles in mainstream releases, but despite their best efforts they can't make anything out of these poorly written husks of characters. Take away its instagram indie veneer and WGGOOTP is the sort of C-grade thriller that would have gone straight to video shelves back in the 90s.